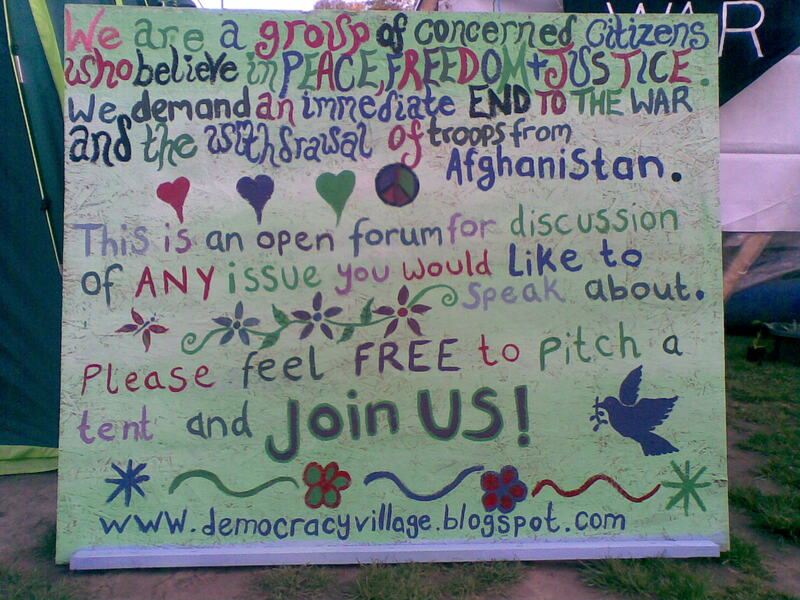 May 5, 2010, filed under Democracy Village Parliament Square Bring Our Troops Home; No Comments. Listen to the people of the country who do not support this futile war. People are dying everyday on for no good reason. Let’s bring an end to this madness. The Democracy village is making a stand to compromise the new Government into putting into action what the really people want! If you plan to stay at the village, please bring a tent, (some maybe available onsite) sleeping bag, bowl, spoon and mug. Also any personal effects you may need. The village promotes peace,freedom and justice. In keeping with this, we ask all villager’s to be respectful to each other, and to help out occasionally with jobs that need to be done. We aim to keep our village in good order. Drink and drugs are not encouraged as passed experience shows this can lead to many problems. We are representing the grass-roots peace movement throughout the world.Our platform is Parliament Square, Westminster, the very heart of political decision making, home place of protestors and free speech! We are now a voice for the voiceless, and we cannot afford to be brought into disrepute. Too many people have died and been seriously injured for us to loose the credibility and respect that a stand like a stand like this represents. All movements are welcome to share and swap ideas etc….